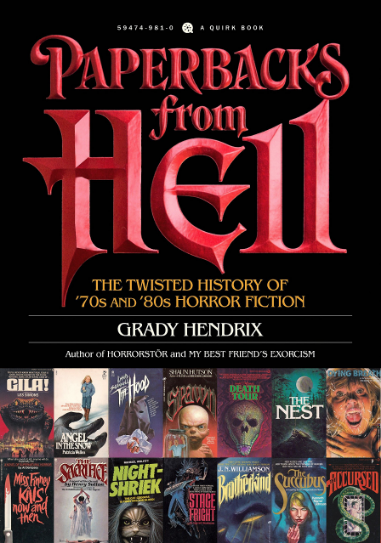 Grady Hendrix (Paperbacks from Hell: The Twisted History of ’70s and ’80s Horror Fiction) presents a mind-melting live performance based on his book, which chronicles the history of horror genre paperbacks. Book sales and signing will follow. FREE to attend and open to the public. 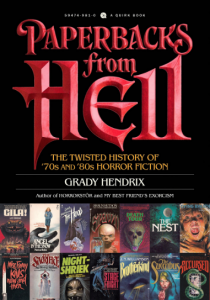 Paperbacks from Hell chronicles the history of the horror paperback publishing boom that started in the early 1970s with the release of Rosemary’s Baby, The Exorcist, and The Other, and died in the early 1990s as serial killers lured horror paperbacks into their murder basements. Hendrix interviewed authors and artists to tell the story of how, for a brief 24-year period, bookstores, drugstores, and supermarket spinner racks were awash in books about Bigfoots, Nazi leprechauns, killer maggots, and rabbis blasting KGB demons with super-shofars. Featuring never-before-published artwork by some of the mad geniuses who painted these gorgeous covers, Paperbacks from Hell follows the horror paperback boom from its roots in books about Satanic possession, to its death at the hands of serial killers.